It is desired to have a lower bound on the performance of estimating algorithms in the sense of MMSE. Many algorithms are developed to estimate noisy autoregressive (AR) processes, though the best performance of such algorithms is still unknown so a lower bound can be useful. We will introduce a novel approach for a special but wide used of AR processes, i.e. symmetric alpha stable (S_S) ones. Alpha stable distributions include gaussian and Cauchy distribution as special cases. 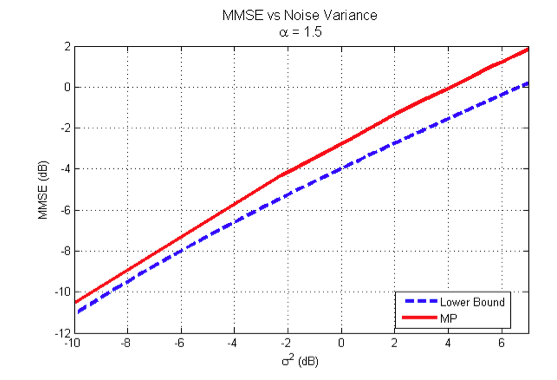 Using large deviation theory, we developed a method that gives a lower bound of MMSE of estimating such a process observed through a gaussian channel. The method is completely general in the sense that it can be used for any orders of AR processes.